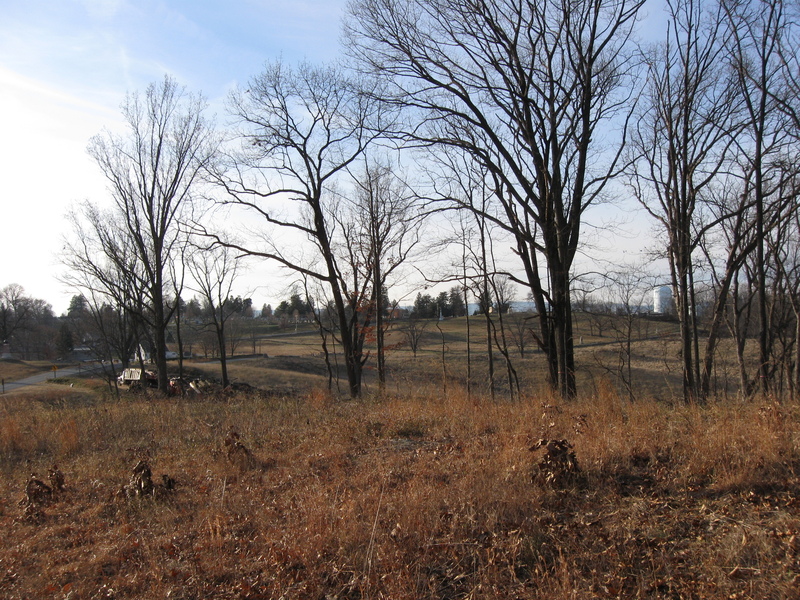 Culp’s Hill as seen from East Cemetery Hill. The purpose of the National Park Service’s project to cut down trees is to restore the landscape closer to what the soldiers saw in 1863. Notice how above the white tent, in the right background, how the trees are not present. This area without trees is one of the views that the National Park Service is attempting to restore. 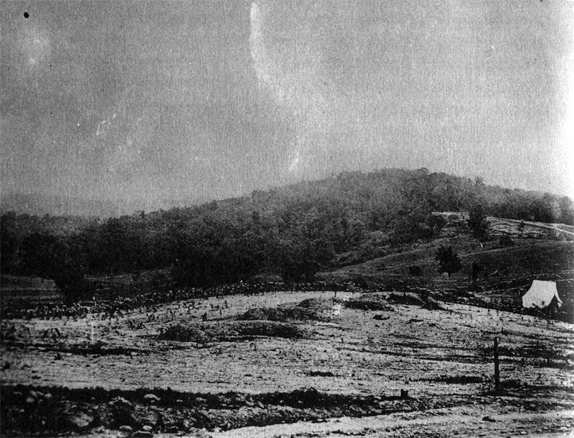 This view was taken facing southeast circa July, 1863. 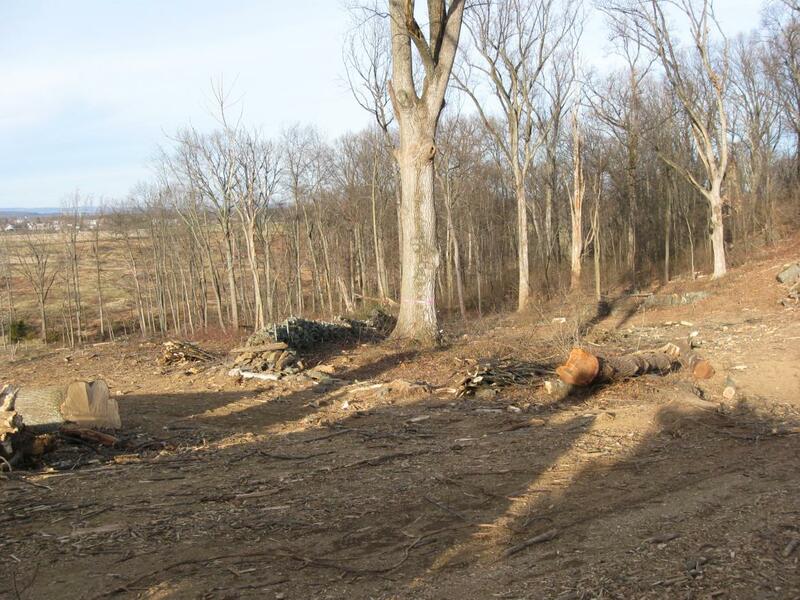 The Culp’s Hill tree cutting continues on the northwest side of Culp’s Hill where the Iron Brigade was positioned from July 2-3, 1863. 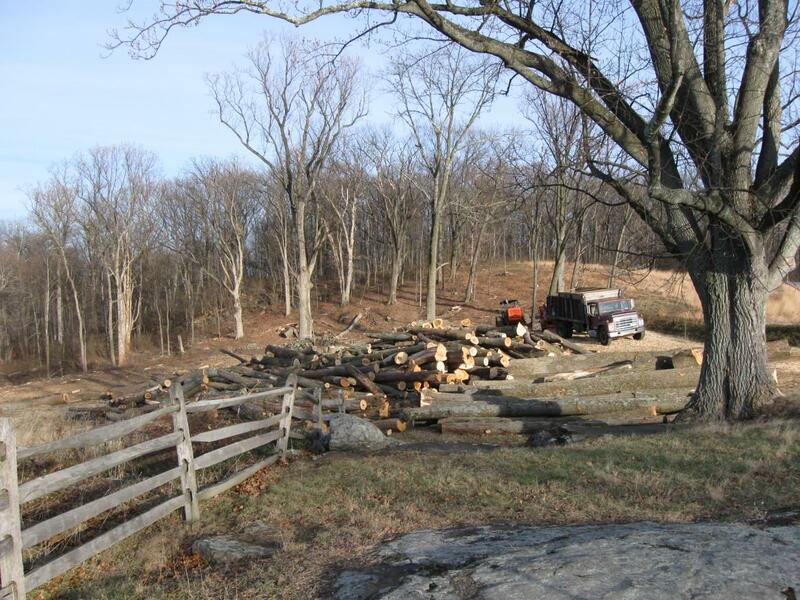 In our first Culp’s Hill tree cutting post we showed you where they began cutting trees starting at the Stevens Knoll section of Culp’s Hill. 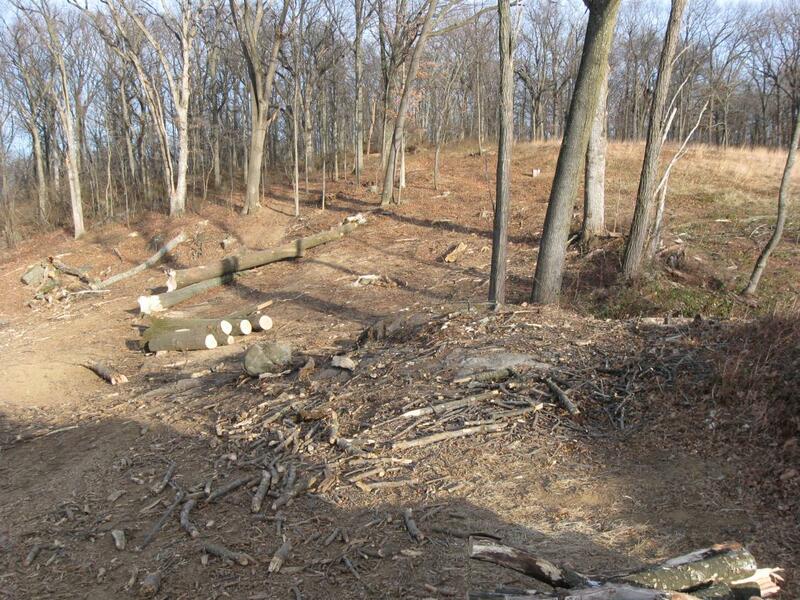 In today’s Culp’s Hill tree cutting post, we show how all of the trees have been cut from a position in front of the 24th Michigan. Many trees have also been cut from the position of the 6th Wisconsin. 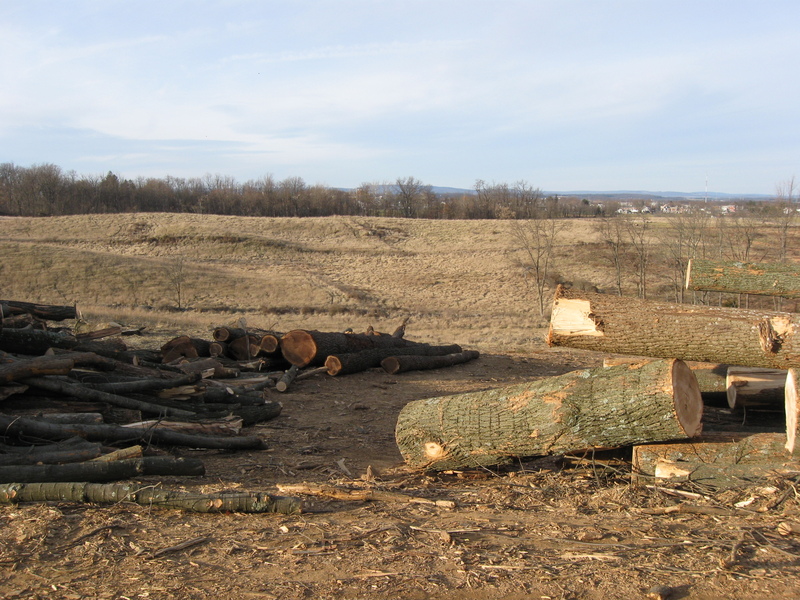 This view from East Cemetery Hill, while not from exactly the same location as the previous view taken in 1863, shows the progress on the Culp’s Hill tree cutting. Stevens Knoll/McKnight’s Hill is on the right. This view was taken facing southeast at approximately 3:00 PM on Friday, December 24, 2010. We last visited here about a month ago. Many more trees have been taken down since then. East Cemetery Hill is in the distance, with the landmark light green/blue water tank. This view was taken facing northwest at approximately 3:00 PM on Friday, December 24, 2010. 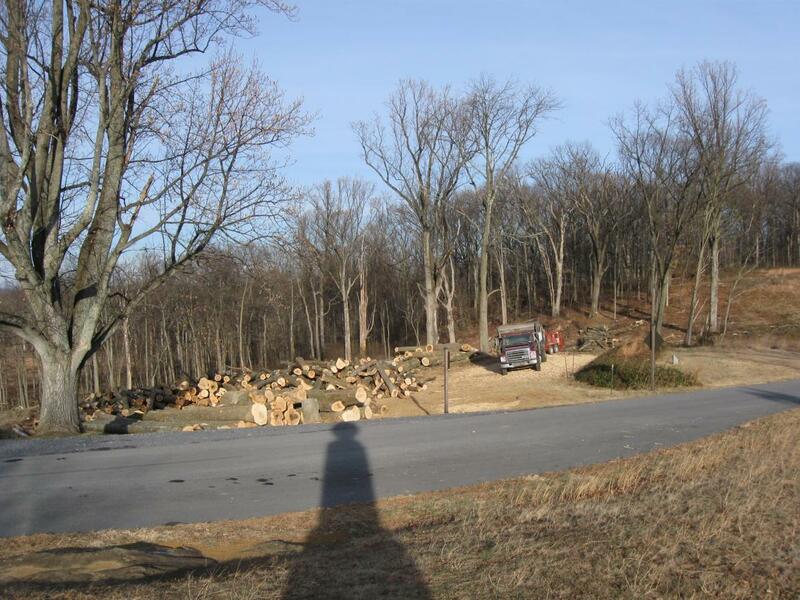 Lots more trees have been removed. This view was taken facing east at approximately 3:00 PM on Friday, December 24, 2010. We are now looking at the tree cutting area from Stevens’ Knoll. The shadow in the foreground is from the monument to Greenleaf Stevens’ Battery E, 5th Maine Light Artillery. Slocum Avenue is between the monument and the tree cutting area. This view was taken facing northeast at approximately 3:00 PM on Friday, December 24, 2010. 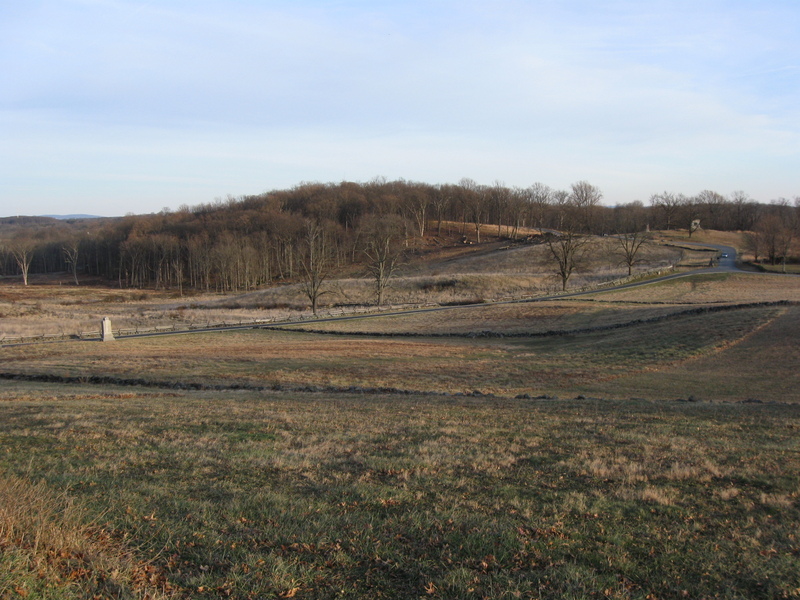 When the Iron Brigade reformed here on the evening of July 1, 1863, they constructed earthworks from approximately Stevens Knoll (behind the camera towards Culp’s Hill which is in the background. 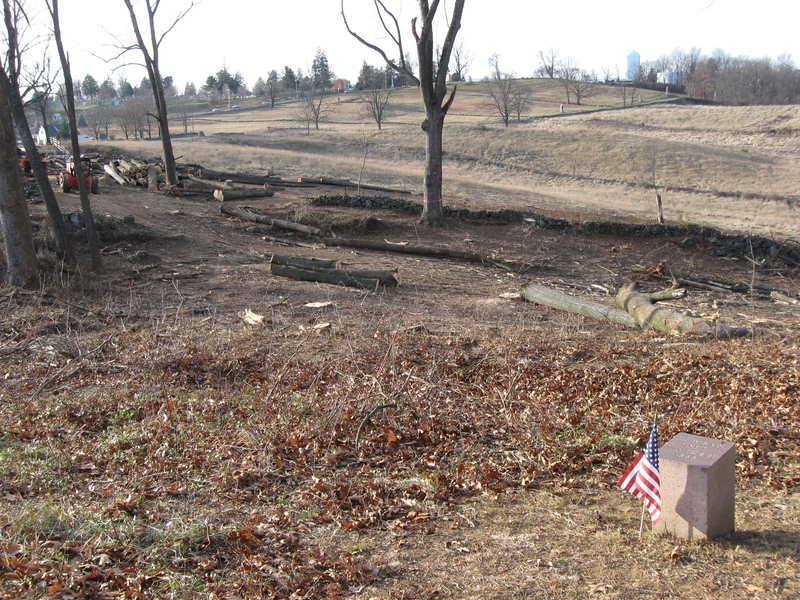 The trees are being removed from this western slope of Culp’s Hill to give one an idea of what the Iron Brigade saw from here on July 2nd and 3rd, 1863. Some reconstructed earthworks are in the foreground marked by the green vegetation. 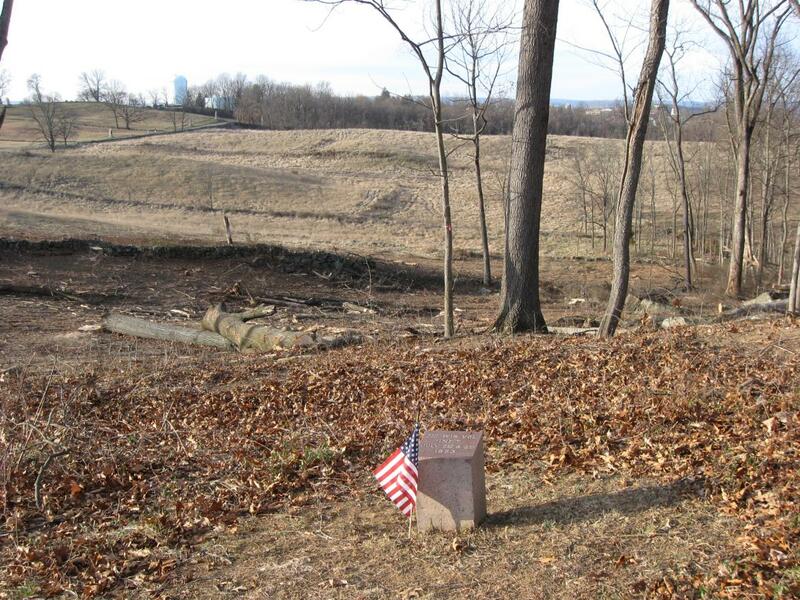 The small, light colored marker to the right the reconstructed earthworks is to the 24th Michigan Infantry Regiment. We will walk towards Culp’s Hill following some of the Iron Brigade’s line. This view was taken facing east at approximately 3:00 PM on Friday, December 24, 2010. 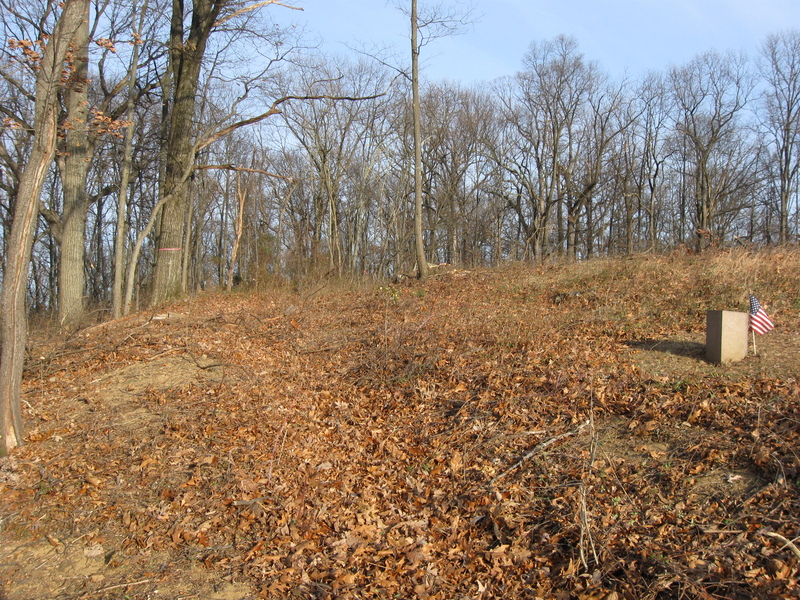 The view that the 24th Michigan had of the terrain in front of them. On the evening of July 2, 1863, Confederates under Major General Jubal Early attacked from right to left as they advanced towards East Cemetery Hill. This view was taken facing north at approximately 3:00 PM on Friday, December 24, 2010. To the left of the large tree is a stone wall. The stone wall still had trees on either side of it when we took pictures here last month. This view was taken facing northeast at approximately 3:00 PM on Friday, December 24, 2010. The slope here has also been mostly cleared of trees. In the right background is the small marker to the 7th Wisconsin Infantry Regiment. We’ll walk to it. This view was taken facing east at approximately 3:00 PM on Friday, December 24, 2010. The marker to the 7th Wisconsin is in the foreground. East Cemetery Hill is in the left background. 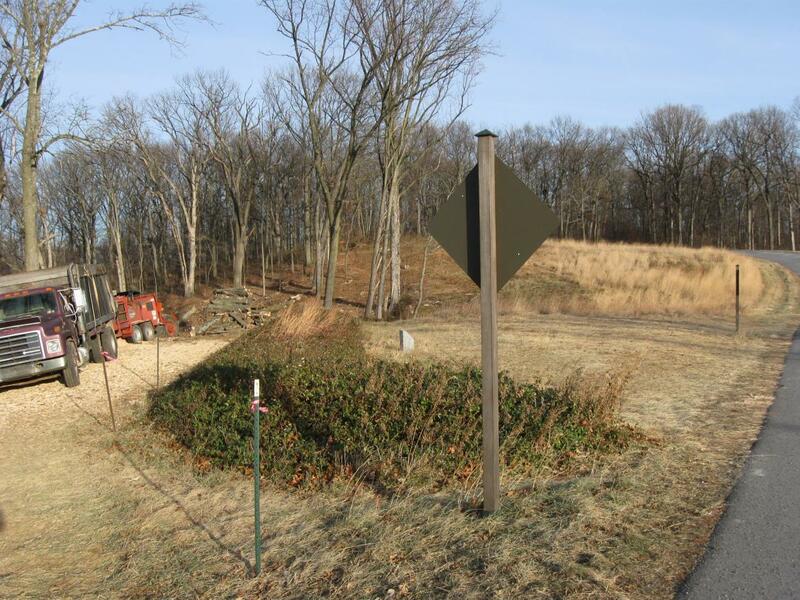 The earthworks built by the soldiers are in front of the 7th Wisconsin where you see a lot of brown leaves. The stone wall in front of the earthworks actually sits on the military crest. We have to wonder if it was there at the time of the battle, why it wasn’t incorporated into the earthworks, or was it manned by some skirmishers. This view was taken facing northwest at approximately 3:00 PM on Friday, December 24, 2010. 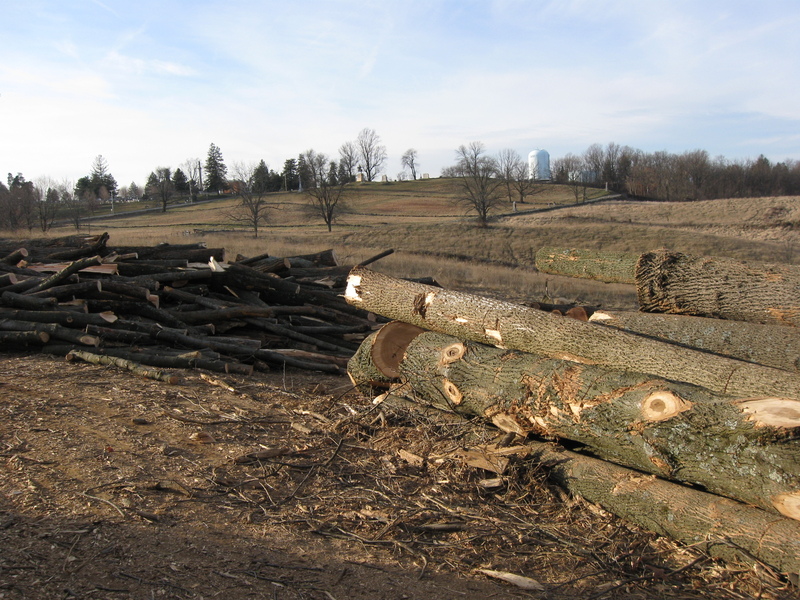 Here’s what this area looked like last month to give you a better idea of how much wood has been removed since our last visit. This view was taken facing northwest at approximately 4:16 PM on Friday, November 24, 2010. The same view facing a little bit more to the north. This view was taken facing northwest at approximately 3:00 PM on Friday, December 24, 2010. We’ll walk farther up the slope to the area where the 2nd Wisconsin Infantry was located. It appears that there will be more tree cutting here because of the pink “Do Not Cut” ribbon around the tree in the left background. This view was taken facing east at approximately 3:00 PM on Friday, December 24, 2010. 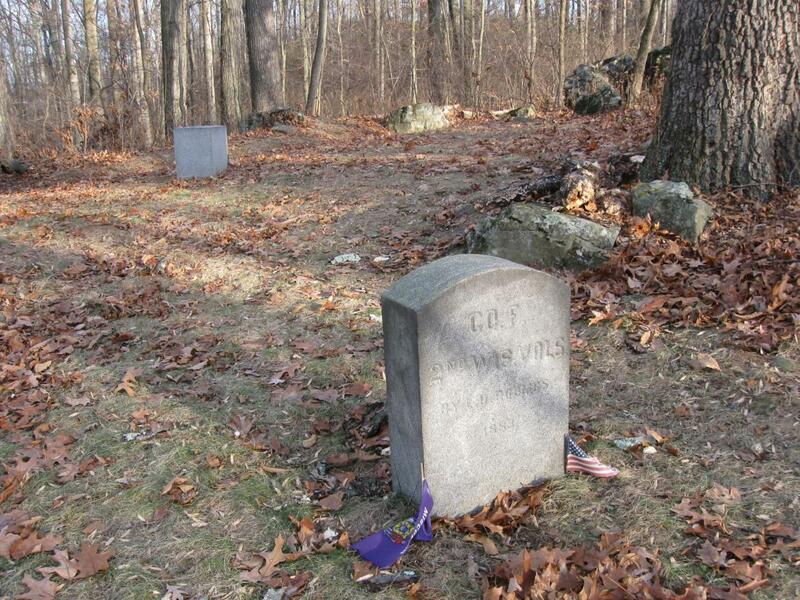 The 2nd Wisconsin Infantry Regiment has two markers for their position on July 2nd and July 3rd, 1863. The reconstructed earthworks are in the right background. 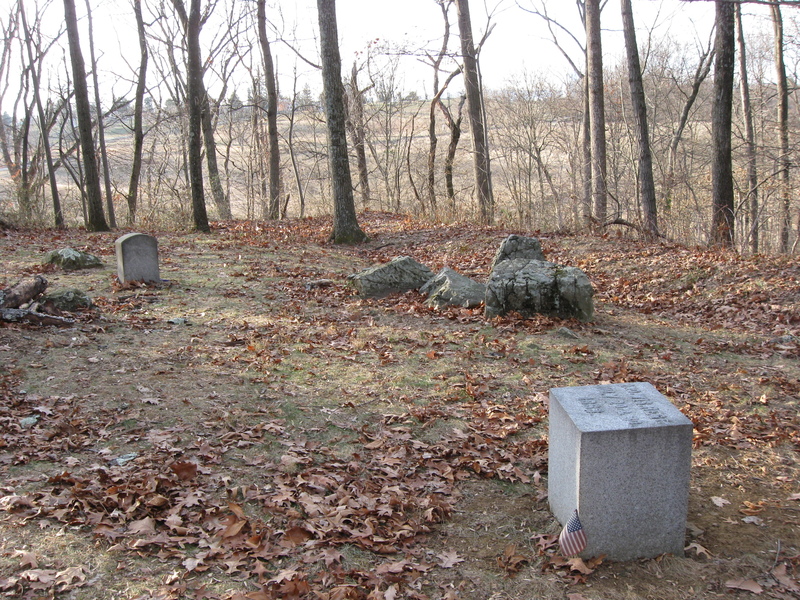 East Cemetery Hill can be seen through the trees in the left background. This view was taken facing northwest at approximately 3:00 PM on Friday, December 24, 2010. 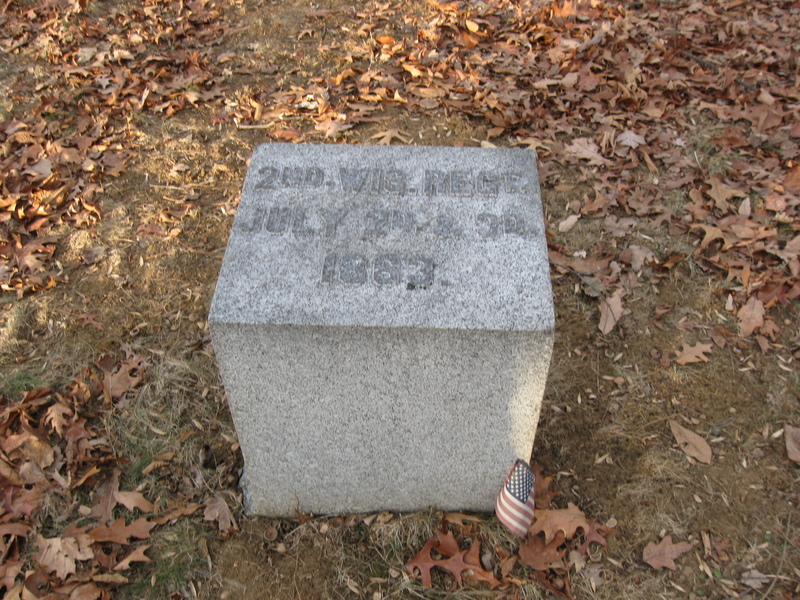 The marker to the regiment was dedicated on June 30, 1888, the same day as the monument on the July 1st battlefield in McPherson’s Woods/Herbst’s Woods. This view was taken facing northeast at approximately 3:00 PM on Friday, December 24, 2010. For some reasons, veterans of Company F of the 2nd Wisconsin placed a separate marker here five years later, in 1893 (or if we read the marker incorrectly, five years before, in 1883). This view was taken facing east at approximately 3:00 PM on Friday, December 24, 2010. 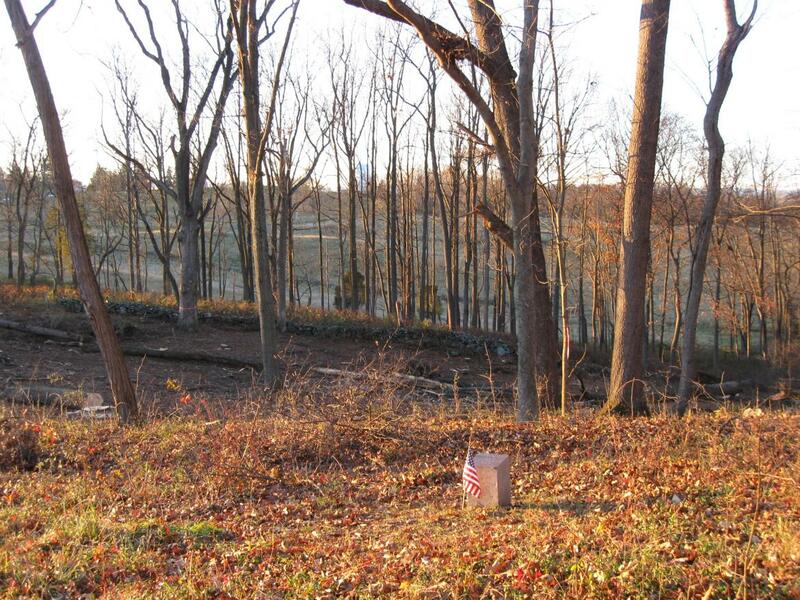 We believe that the view of East Cemetery Hill and grounds north of the Iron Brigade’s position on the west slope of Culp’s Hill is coming along very well. This view was taken facing northwest at approximately 3:00 PM on Friday, December 24, 2010.